We are days away from MEAET, powered by PKN, which will be featuring some exceptional lady bosses sharing their experiences that helped them grow into the female entrepreneurs they are today. Topics will range from being a career-driven mom, empowerment, and the wisdom some wish they had when starting out. 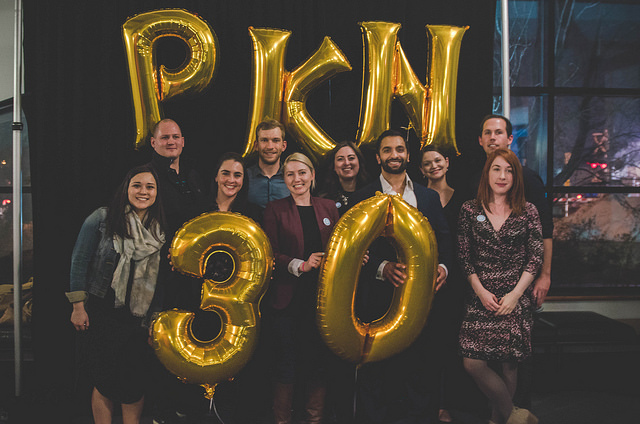 For those who haven’t had the chance to see what a PKN event is all about, here’s a recap of our last Pecha Kucha Night, PKN30, held at NAIT. The group of individuals that spoke at PKN30 were all previous and memorable PKN faves. First up was Brittney Le Blanc. She spoke of her mission to meet 5,000 new people within one year. And I’m not talking about a Facebook friend request or an Instagram follow. I mean actually meet in person, eye-to-eye, face-to-face. Introduce yourself and have a real conversation. Imagine that. This might seem like a daunting task to many of us in the era of social media, but Brittney did it by travelling and attending community events, such as a Ukrainian wedding. Brittney surpassed her goal and met 5,033 individuals in 365 days— averaging 13.7 new people a day. From this experience, Brittney took away a new appreciation for both introversion and extroversion. She learned that it’s ok to ask for help whether you need help meeting a ton of new people or anything else life throws at you. Asking for help is not a sign of weakness—it’s a sign you are ready to take the next step. She inspired us to be more open to meeting more new people. You never know what passionate individual is just a “Hello, my name is” away. Leroy Schulz told the tale of how he started sending a little green toy car around the globe. This car made it into the hands of people like Jack Layton, Kate Middleton, Snoop Dogg, Stephen Harper, Justin Trudeau, Daryl Katz and Salman Rushdie. “The idea is that we are all connected,” Leroy explained. He suggests we make better decisions when we recognize and appreciate that we’re all part of the same global community. Omar Mouallam, the self-proclaimed “Steve Jobs of kebabs,” shared his love of donairs and how Halifax had deemed it the city’s official food. Whether you know it as a donair, kebab, gyro or shawarma, the tightly wrapped deliciousness has truly become a Canadian staple for late-night snackers. On the sweeter end of the food spectrum, Andrew Williams endorsed pineapple as the most interesting fruit in the world. One of the facts that stood out most was how the bromelain in pineapple digests protein enzymes in our bodies. In plain terms, when you eat a pineapple, it’s eating you back!! Whether the stories shared were serious or funny, thought-provoking or inspiring, it is abundantly evident that Edmonton is chock-full of some pretty talented individuals. This Wednesday, check out MEAET powered by PKN event. Hear fantastic pitches from some of Edmonton’s most exciting, up-and-coming female entrepreneurs. As the audience, YOU get to vote on your favourite pitch and some of the proceeds from the ticket sales go towards the winner’s project! Plus, enjoy tasty treats from local, woman-run restaurants and vendors.